Starting a business is a huge challenge in itself but trying to keep it running on a day-to-day basis can be even harder. In order for your business to thrive, it takes more than just your blood, sweat and tears. 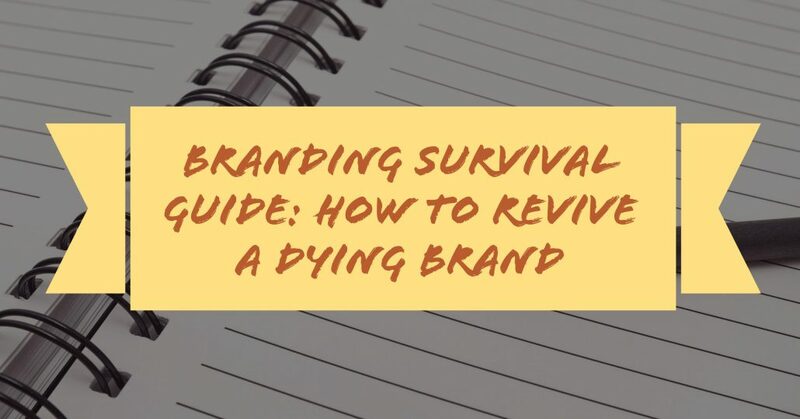 For branding survival, you’ll also need a marketing strategy that’s bold, distinguished and strong, enabling you to not only reach out to new customers but to retain existing ones too. However, even with the best marketing techniques and bags of determination, some businesses still face tough times, especially when external factors arise that are out of their control. And if this is the situation you find yourself in today, you gotta have faith (thanks, George Michael) because there are a number of ways you can take control back, helping your business to thrive again. To be successful when you’re reviving a dying brand, you need to find out exactly what’s gone wrong in the first place. Think of it like when you get ill – you don’t just stay at home popping pills in the hope that you’ll get better because you could make things a whole lot worse. Instead, you’ll go to the doctors for an accurate diagnosis and this is exactly what your brand needs too. You need to spend quality time trying to find out what’s caused this problem so you can develop an effective business plan that will help you to revive your business. It’s also worth looking at your businesses strengths and weakness as a whole, honestly evaluating where your business does things right and where it could make dramatic improvements. We know this is like asking you what you like or dislike about your child but if you can find out what makes your business different from your competitors, you can use this to your advantage as you go through your rebranding efforts. Things are constantly changing and evolving, so it’s incredibly important that your company is on top of all of the latest innovations so it can provide the best possible services / products to its customers. Take a step back and evaluate your products, looking at them from a customer’s perspective. Would you buy them? Do they stand out from the crowd? Do they offer something unique? Get into undercover mode too and look at what your competitors, taking inspiration from their products so you can find a niche (a better one, of course) for your own. And don’t forget to look at the industry as a whole, working out whether you’re targeting the right customer base and whether the requirements of your target market have changed. Once you’ve done this, you’ll need to find out how customers are going to benefit from shopping with you. Being able to identify where you sit in the market and what your product capabilities are won’t be enough to revive your brand. You need to understand how your customers are going to use the service or product you’re offering. What experience are they looking for? How are they going to learn about your products and how are they going to use it? This is critical when trying to get customers to re-engage with your brand. Now that you’ve evaluated where things have gone wrong (a painful process, we know) and you’ve developed your new product offerings, you need to market them to the masses. But don’t just fall into the same marketing strategy you were using before, even if it was effective when you first started out. Brands that have successfully revived themselves have done so with the launch of a new marketing campaign that’s engaged and compelled customers, and this is exactly what you need to do. Get the team together and throw some ideas around, working out how you can attract customers and regain the trust of the ones you’ve lost. Having a new clear strategy will help you create the consistency that you’ll need for your brand to succeed, so make sure all of your employees are on the same page too. As the business owner, you’ll probably be more comfortable talking about the background of the company but it’s important that your staff can do this too (plus you don’t want a motormouth employee divulging your deepest, darkest secrets either!). So, draft up some slogans and talk them through some pitches so the entire company is passing the same message across to customers. And finally, don’t forget to create lots of content about your business so your customers feel informed at every stage of their purchasing journey. Be meaningful in your content and showcase your expertise, sharing it across a multitude of platforms such as Facebook, Twitter and LinkedIn. Reaching out to influencers and creating conversations around your brand will help to make sure you’re seen as a trusted leader in the industry because customers don’t just want to hear about your products all the time (if you just do this, you’re the business equivalent of a baby bore). In summary; if you can identify the root of your problems, you’ll be able to create a strategy that helps you to focus on the products you are selling and the market you’re targeting. With this in place, you can then put together a marketing strategy that helps to put your brand back in front of your customers, with a consistent message and a trustworthy image. And don’t forget one of the most important things you need as you go through this process – belief. If you look downhearted and as though you’ve given up, your employees won’t be inspired and the messages you send out will be lackluster. Embrace your company’s vision and commit yourself to its success and your employees and customers will develop the same belief in your brand.